05.04.2018 – Berlin. Producers, retailers and small and medium-sized warehouse providers can now benefit from a new web-based warehouse forum. It is called ShareHouse and was launched at the beginning of this year. In the light of the booming e-commerce sector, ShareHouse is designed to help users cope with the seasonal fluctuations, which are commonly encountered and particularly increase costs in the consumer goods industry. ShareHouse is a completely independent start-up established by the logistics specialist, Imperial Logistics. “We’ve developed ShareHouse at our supply chain laboratory in Berlin together with customers and tailored it to the issues faced in everyday practice,” says Jörg Klöpper, Managing Director of ShareHouse GmbH & Co. KG, explaining the situation. The target group primarily involves small and medium-sized companies that will obtain new opportunities through ShareHouse to efficiently digitalise their marketing of warehouse space. “As a result, we’re reducing the hurdles for these companies as they take the necessary step of launching a digital, forward-looking business model,” Klöpper adds. Manufacturers and distributors, but particularly e-commerce providers (online retailers), regularly require buffer storage facilities at short notice for consumer goods because of seasonal sales fluctuations. A large number of industrial companies have to respond to strong fluctuations in demand at least twice a year. They then either lease storage capacity at short notice or they switch operations between different warehouse providers – with all the costs and effort involved. Retail and fashion store chains, the entertainment electronics sector, providers of fast moving consumer goods, online retailers as well as shippers of non-perishable foods in particular face this kind of situation. There has hardly been any transparency about storage space that could be provided at short notice for those making enquiries in the past, let alone transparency about prices and possible value-added services. The warehouse operators are also affected by a high degree of fluctuation. They are unable to make ideal use of their warehouses because of strong fluctuation levels by customers. This gives rise to excess capacity or shortages – i.e. unused spaces or shortfalls. In short: while producers and retailers repeatedly have a short-term need for storage space, warehouse providers require goods on a regular basis to fill storage areas that are not being used to the full. This is precisely where ShareHouse comes in. Warehouse providers publicise their free capacity on the platform – while producers and retailers from all over Germany are looking for suitable space that is required at short notice. ShareHouse brings together both sides until an agreement is signed. Both sides benefit from this – enquirers from the high degree of transparency and rapid arrangements – and warehouse operators from the improved utilisation of small and medium-sized storage areas in the long term. Additional services in the planning stage: In addition to arranging storage space in the short and medium term and appropriate insurance services, ShareHouse is being continually expanded to include additional operations. For example, a warehouse provider can manage its storage spaces virtually through ShareHouse in future. Particular functions of a warehouse management system (WMS) are activated for this purpose. In addition, key performance indicators like utilisation levels, picks and the current turnover can all be accessed. ShareHouse will also offer additional services related to the core product of warehousing as part of ongoing developments. They include digital document administration, customs clearance and transportation, tracking consignments and solutions based on the Internet of Things. ShareHouse is a digital market place for warehouse space. 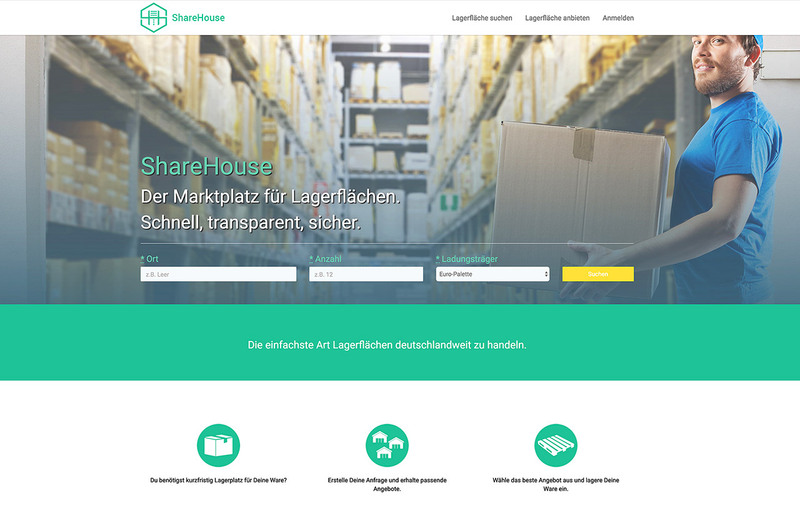 ShareHouse is operated by IT and logistics experts at ShareHouse GmbH & Co. KG, an independently operating start-up established by the logistics specialist, Imperial Logistics. ShareHouse offers business customers a rapid, simple and transparent opportunity to book small and medium-sized storage areas across Germany in line with needs and at short notice. ShareHouse enables providers of warehouse space to market free storage areas among a large number of interested parties. As a result, providers increase the utilisation levels at their warehouses, prevent empty spaces caused by seasonal fluctuations and increase the profitability of their logistics property. Warehouse providers can enter their free warehouse capacity at the market forum and regularly receive booking enquiries from interested parties. They have to be confirmed or rejected within 24 hours. Interested parties can enquire about additional services that the provider calculates in line with needs. The length of the rental period is flexible. There is no minimum time for renting space. It costs nothing to offer warehouse space. ShareHouse only charges the provider an agency fee of 10 percent of the value of the contract once an agreement has been signed. If the customer should extend the contract at the end of the agreed period, no additional agency fee is charged. The warehouse provider sends the invoice directly to the enquirer. The costs of the storage are based on the provider’s quotation.